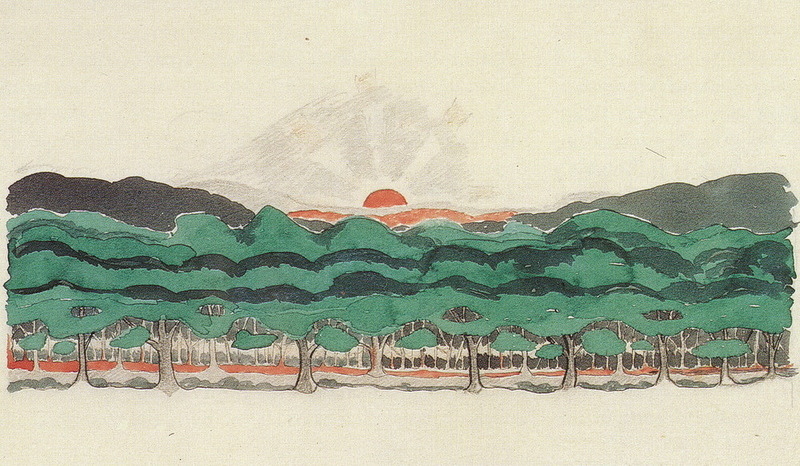 Tolkien's Landscapes 6: 'Wood at the World's End'~ picture by Tolkien, poem by jan-u-wine. Although utterly different in look and feel to the starkly geometric Moonlight on a Wood, Tolkien's The Wood at World's End (1927-28, pencil, black ink, watercolour) is a similarly highly stylized piece. The mountains dip in the center nearly symmetrically to frame the setting sun and the treetops merge to form a rolling green expanse, almost like waves. In the sea of trees the ranks of their boles are like great stalks of seaweed rising from the ocean floor. It isn't realistic, but the forms together create an almost mesmerizing effect. The painting inspired jan-u-wine to write a wonderful new poem, rich and contemplative. It depicts Sam's thoughts as he sails towards World's End, the Undying Lands. For those interested, an additional paragraph about the painting is provided at the bottom of the post. took delight in the Sea. in the very thought of her. as a mother holds a babe. to greet whatever may come. he has dremed upon the Sea. 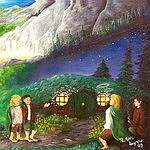 Throughout most of Tolkien's art from the years 1927 and 1928, two pictorial elements predominate. 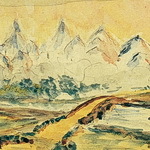 One was mountains, which he drew in abundance in rugged 'Silmarillion' landscapes such as Gondolin. The other was trees, with which he was even more enamoured. (...) Massed together, trees comprise The Wood at the World's End, its title a commingling of two by William Morris (The Wood beyond the World and The Well at the World's End). 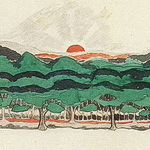 The painting may depict sunset in Valinor, the end of the world west of Middle-earth, or it may be unrelated to Tolkien's mythology; but it is an evident precursor of his dust-jacket art for The Hobbit. ~ "The Misty Mountains": picture by Tolkien, poem by jan-u-wine. What a stunning poem. And the artwork shared is usually new to me. Shirebound, I have an unrelated question. Are you getting email notifications of reply? Since the previous post I haven't been getting any. I've checked my settings for notifications and they are unchanged. Strange. This hasn't happened to my LJ before. Sorry for the delay! I've been out for about the last six hours. I came back to quite a few comments, but don't know if they were delayed or arrived on time. I don't think I'm having any problems getting comments. If it's still happening, be sure to open a support ticket! A support ticket? That must be when one asks for assistance. I've done that in the past and while their answer didn't help me (for a different problem), they were quite prompt and courteous. Thanks, Shirebound! Shirebound, I have another favour to ask. I see that most of my images in this post as well as in previous posts have suddenly gone away, replaced by ads from Photobucket telling me, "upgrade to Plus for additional bandwidth". I'm wondering if this view (with the images replaced by ads) is only seen by me, or if other people opening my LJ see the ads instead of images too. Grrr. Also, when I go to Photobucket and click on my username, I see how much storage I have. See if yours is full, or close to full. Thanks so much! Well, considering I posted three images in this post and now they're blocked out, they must have been the straw that broke the camel's back. I guess I'll have to start using my Scrapbook (on LJ). I have always used Photobucket because it's been easier to work with. But if I've used up my bandwidth, I'll switch. I don't want to have to pay a fee if I don't have to. Although I've got thousands of images posted in this LJ, I hardly post anything new anymore. Again, thanks so much for the tip, Shirebound. Also, with your help, I put in a support request about my lack of emailed comment reply notices. Thanks so much! Hi! I just replaced the images for this entry with ones I just posted in Scrapbook. Of course I'm not going to go back and replace every picture I've got in this journal, but I'll be using Scrapbook in future, now that I know all my Photobucket images are going to poop out every month at such-and-such a time (as if my LJ were having it's period, ha ha). very interesting! and the poem is beautiful. What a great poem, Jan. I really love it. With my mind, I can understand how Sam feels about his forest but with my heart I take delight in the Sea, just like Frodo. That’s a very apt comparison. It’s absolute magic to swim around in such a kelp forest. The leafy parts of the kelp spreading out on the sea surface create a roof to the underwater landscape, just like Tolkien painted here for the trees. I'm glad you so enjoyed the piece, Ambree, because I agree, it's a great poem. You've snorkeled in a kelp forest? It must have been marvelous. Full of fish-birds, too? :) I have never snorkeled, only seen such things in pictures. Oh, Ambree, thank you so much. As I was writing it, I feared that it could not/would not be understood. But i see that you have. I'm so glad. I think that Mechtild's into is so brilliant. The portion you picked out is especially lovely. It IS magical to swim underwater in kelp forests. There is, somehow, a fine sound there....it's almost like a music...but it is on the line of being not audible. I don't know what it is, but it renders the experience of being in that 'forest' almost unbearably beautiful. Of all your poems, this is one of my favorites, Jan.
thank you so much, Ambree! did not know that sound was a common phenom. I remember it from diving off Catalina in CA, and there are chains on the ocean floor. I thought (because i couldn't imagine what else it could have been) that it had something to do with them. I prefer to not think it is shrimp pincers, either. How about the soft shaking of the bridle-bells of a long-drowned Numenorean horse? with the earth gathering them away from their havens and storing them--it makes me think of Hades carrying off Persephone, the way Sam has figured the earth as a hunter and gatherer of light--kind of a predatory thing--that fierce, and kind of scary side of Sam--the Nurturer as a fearsome force. But that is what the chlorophyll of leaves does, isn't it--harvesting light. Sam of the Earth as harvester of light. Frodo of the Sea as reflector of light, keeping none of the warmth after it passes for himself. Mechtild's description of the sea-like forest sets us up for Jan's Sam with his wood overlaying the sea, as he compares his preference for earth, and that which grows upon it, with Frodo's for the sea. This painting brings trees and earth together with the ocean, just as the ship unites Sam with Frodo. I like that it's left ambiguous if he is seeing the shore of Tol Eressea or a mirage upon, and of the ocean. Sam as hunter! I hadn't thought about that but I suppose being a gardener has its hunter aspects, tracking down and bringing to the growing things what is good, tracking down and smiting what threatens them. Your comment is chock-full of thought-provoking stuff, Lavender. When I read one like this, which provides alternative ways of reading a piece, and of perceiving things generally, I feel as though you have taken my brain like a carpet, shaken it, fluffed up the nap and tacked it down in a new spot. I stand back and say, "ah, yes ... it looks good there, too". It inspires me to look at the poems and pictures again, too, which surely is a function of everything called "thought-provoking". 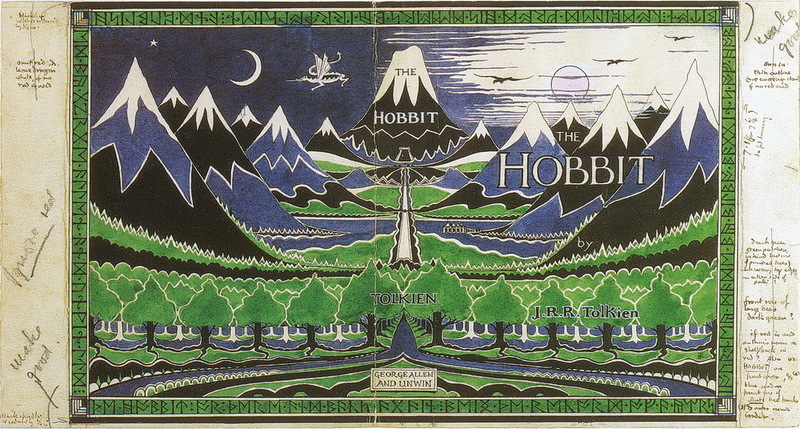 As to the Hobbit dust-jacket, I love it, too, but I can't compare the two, they are so different. The dust-jacket is absolutely brilliant, but it attempts a good deal more than the little watercolour. Is the small structure just to the right of the middle of the picture what you are seeing as Rivendell? I thought it was Laketown. I suppose its details are full of opportunities for "applicability". :) Whatever it is, it's a terrific book jacket. I never noticed the corner designs the way you have done. I guess I thought of them as a pleasing arrangement of lines, not associating them with spider webs. But now that I look at them, I wonder... You really do have an eye, Lavender. I love what you say about Sam as a harvester of light, whereas Frodo is a reflector of it. That has a real feeling of truth, that does. I can't say enough how i love Mechtilds intro, her description of the sea-forest. It's beautiful. thank you for the wonderful comments, and i am glad you enjoyed the post! Oh my! I had never thought of it like that! And the symbolism of Frodo & Sam as the woods and sea... Breathtaking! My goodness! Is this about the end of Middle Earth? I wonder if it's our beautiful Frodo speaking, wandering through the Undying Lands... Just a thought. Not to worry. Here's what I wrote in the introduction above: "It depicts Sam's thoughts as he sails towards World's End, the Undying Lands."